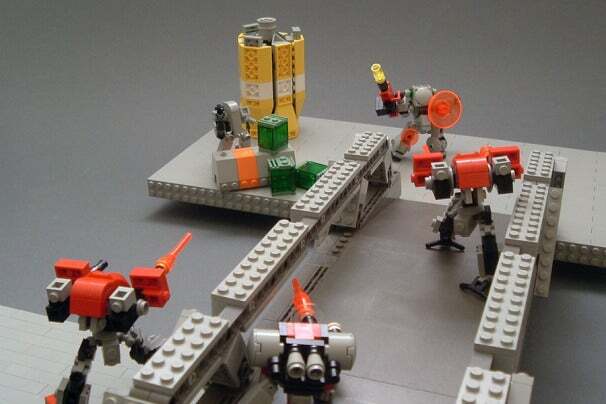 Mobile Frame Zero: Rapid Attack is a strategy game that has you build robots out of Lego and then pit them against your opponents' robots. It's a Kickstarter project created by Vincent Baker, Joshua A. C. Newman, their apprentice Sebastian, and Soren Roberts that made it halfway to its $9000 target in just 10 hours, and was fully funded in under a week. With 29 days to go, the funds continue to roll in. It's a little like Risk, but it's set in outer space and you get to build the game board and your pawns--which just happen to be intergalactic robots--out of Lego. The robots, referred to as mobile frames, battle on behalf of three factions: the colonial, Earth-centered Solar Union; the religious and revolutionary Ijad; and the independently minded Free Colonies. Regardless of which faction you represent, you'll have a limited number mobile frames and limited equipment, so each fight will be a struggle as you race against the doomsday clock to be in the strongest position when it reaches zero. This is just a taste of the backstory and gameplay for Mobile Frame Zero: Rapid Attack. Check out the Kickstarter page if you want to know more. The game itself is essentially a set of instructions on how to build your robots and the game setting, although in the spirit of Lego, playing off-script is strongly encouraged so you can get creative while setting up the game. You also get instructions on how to actually play the game. You are required to provide the Lego blocks, or other similar building toys, as well as the dice. This is either the craziest--or most awesome--game I've ever heard of. Given its popularity on Kickstarter, I think it may well be worth checking out.